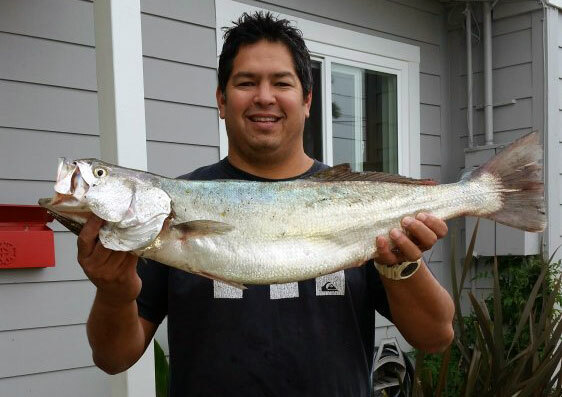 San Diego’s population of shortfin corvina is one of the most coveted fisheries in southern California. Anglers “in the know” speak of them in hushed tones even today, and hold their favorite corvina spots closely guarded. Shortfin corvina are thought to have arrived in San Diego Bay again in 1997 during the last significant El Niño which brought warm water currents up the coast from Mexico where they were already established. The corvina were pleased with the warm waters of San Diego Bay’s southern end, which at that time was often 10 degrees warmer than the rest of the bay. That was due in part to the South Bay Power Plant which pumped water through its turbines to cool, resulting in warm water being pumped back into the bay. That plant has since been closed, so the water isn’t as warm now as it was. However, because the South Bay is shallow, the water does stay warmer than the majority of the bay. Anglers fishing for bass started catching corvina after that El Niño, but mostly confused them for juvenile white seabass. 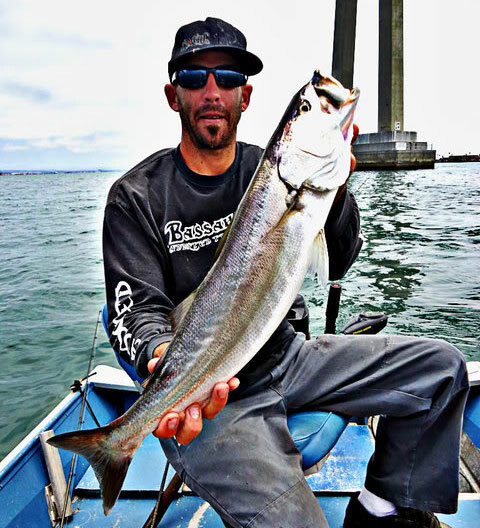 Because white seabass have a minimum size limit of 28″ and corvina rarely exceed that – corvina were almost always released, which helped establish the population that resides in both San Diego Bay and Mission Bay today. Still, the fishery needs to be respected and handled responsibly by anglers. Corvina are naturally fragile, pouring their hearts out during the fight, a prompt return to the water (or never having been removed even better) with minimal handling is necessary to a successful release. There are few, if any fish in town that need to be honored with strict catch and release the way that corvina are. If you want to keep one for dinner, please make it a rare occasion. Corvina can be caught in both San Diego Bay and Mission Bay year-round, but spring and early summer present the most favorable conditions. Corvina like warm water, and they’ll follow the warmest water around the bay. 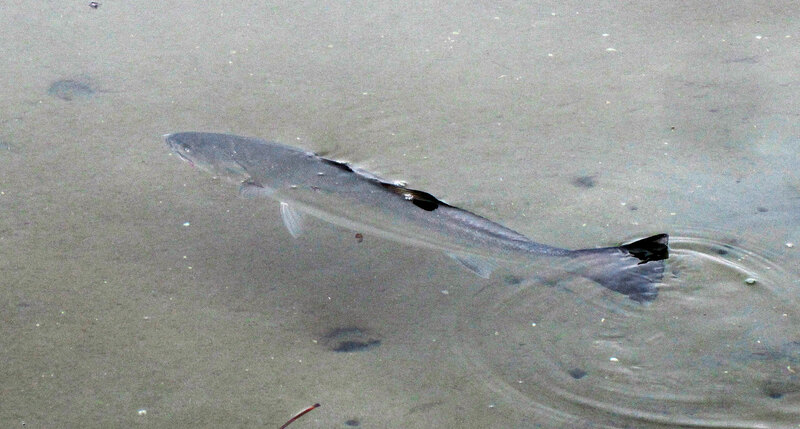 Because shallow water warms fastest, look for them in areas of 3-10′, and in the spring they’ll cruise around shallow flats around harbors and marinas in small “wolf packs” hunting baitfish. An incoming tide makes that behavior even more prevalent, as they follow the water movement up onto the flats to feed. 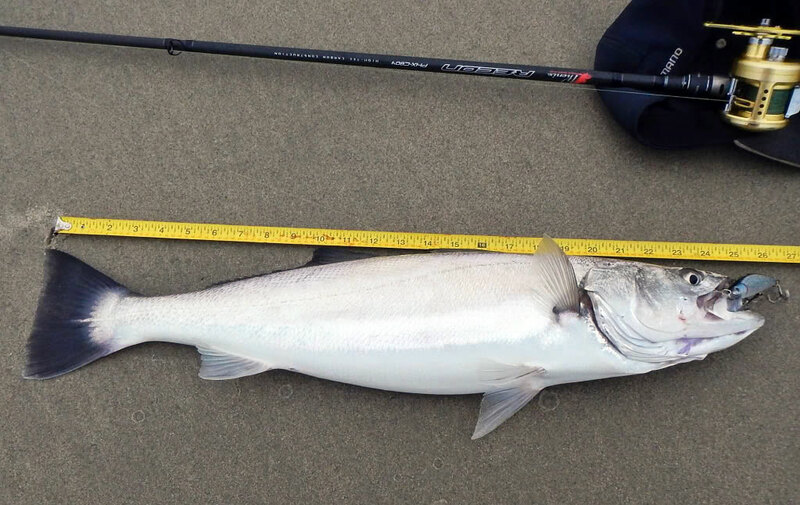 Aside from how hard they fight, the thing that makes corvina fishing so exciting is their aggressive strikes. Fishing for corvina is a lot like fishing for largemouth bass on the lakes in late spring, summer and fall. 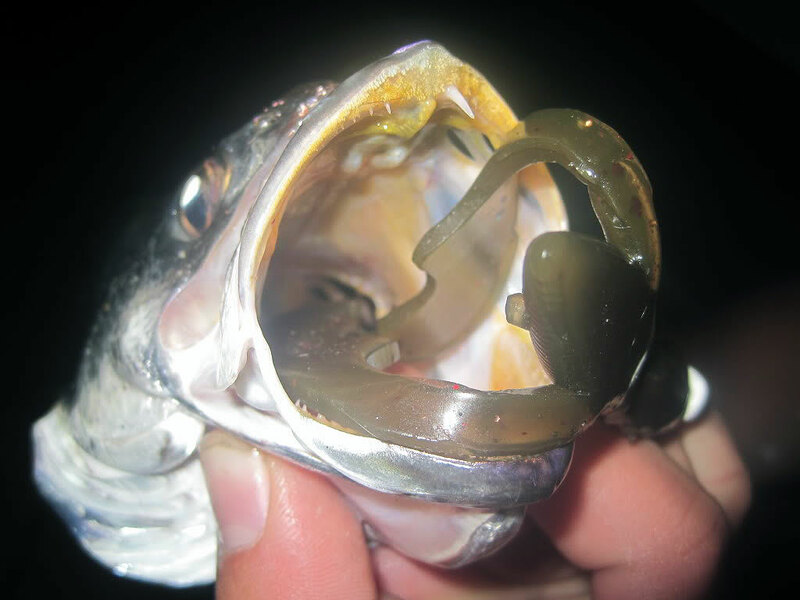 While they’ll eat live bait, the most popular method for targeting them is with jerkbaits and small topwater baits, fished exactly the same way you would for largemouth bass. Rod: 7′ medium to medium heavy rods with an action suitable for the type of bait you’re using. Look for rods designed for freshwater bass fishing and designed for jerkbaits or topwaters if thats what you’re using. Line: 8-12 lb. test depending on the lure or presentation. I prefer fluorocarbon when possible, but for topwater baits you need monofilament to fish properly. So if you’re walking with one rod, go with mono so you can do both. 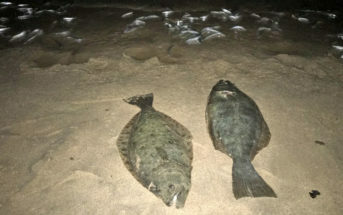 Halibut can be caught with the same methods, fishing with heavier line like 12 pound would give you a better shot at landing a keeper halibut should you hook one. 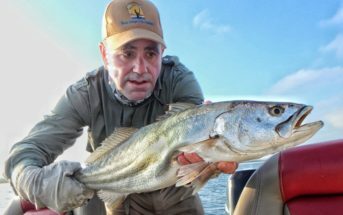 While my favorite way to fish for corvina was to wade or walk the shore, they can also be caught from boat along the same flats, or by trolling the edges of the flats to target fish that aren’t as actively hunting for food. While all anglers have their favorite spots, corvina move around quite a bit, and as mentioned will follow water temperatures and tidal movements. 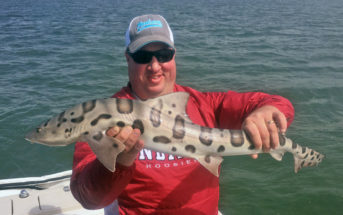 So spots aren’t key, and any shallow flats in either of the two bays are good places to fish. Look for areas that seem to hold bait, and areas that have some sort of structure that the corvina can use to pin bait against. Harbors and marinas make excellent spots, as schools of corvina can push bait fish up against the hulls of boats or the underside of docks to feed. The sportfishing basin in Point Loma is a particularly popular spot for corvina fishing at night, as the lights from the boats draw baitfish, which in turn obviously draws in predators like corvina. 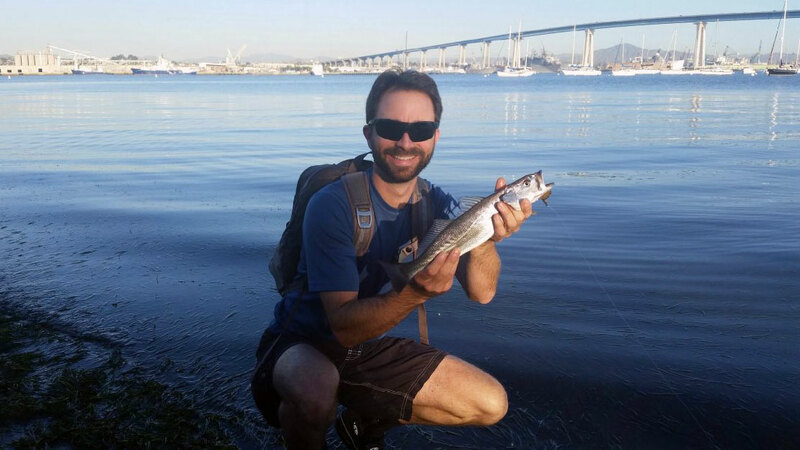 Other notably effective corvina spots on San Diego Bay include Tidelands Park in Coronado, the channel of Liberty Station, the Embarcadero and other marinas (particularly in the spring and early summer at incoming and high tides). 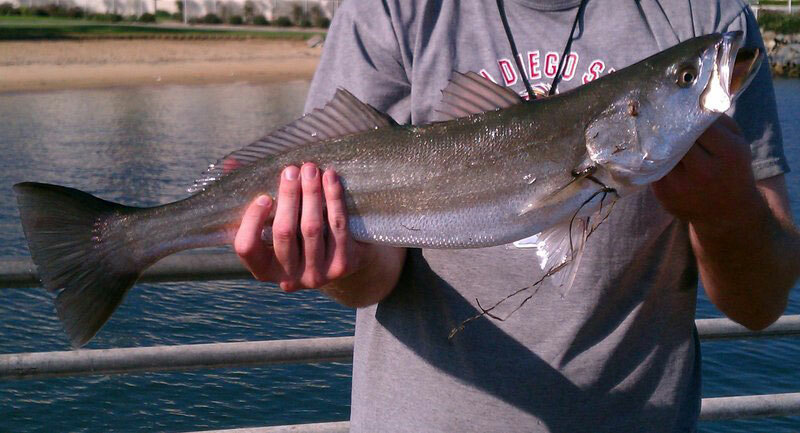 In Mission Bay, look for flats that have eelgrass as that holds the bait, really any area in Mission Bay can hold corvina, as the entire bay is a giant shallow sand flat basically. Still, Fiesta Island and small bays at the neck of the island are noteworthy. Because corvina hunt in schools and are always moving there are a couple approaches you can take. 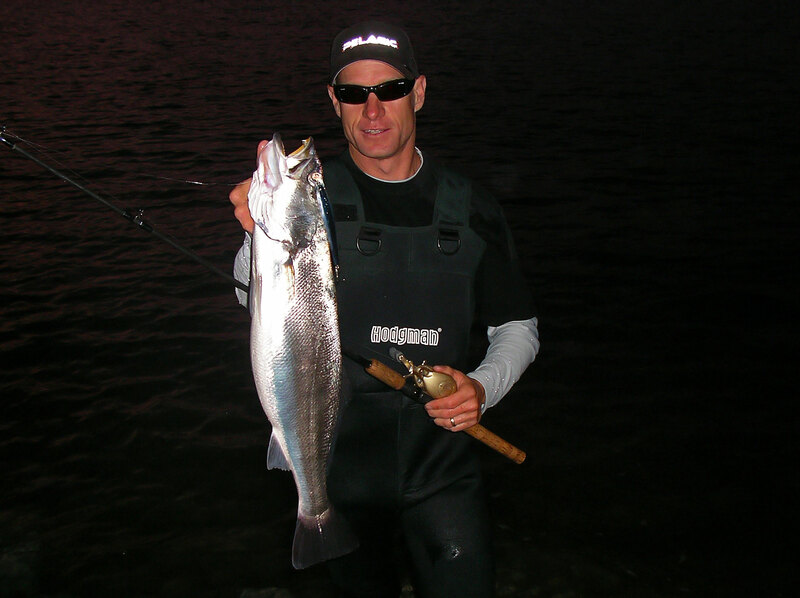 You can either pick a stretch of shoreline to cover by walking and casting, or pick a spot that you think would attract bait and feeding fish, and stay there fan casting until the corvina come through. When you hook one, quickly release it and get another cast in. You’ll usually catch them in numbers, and go long periods in between flurries of bites. Don’t be afraid to put on a set of waders and get out in waist deep water on especially shallow flats, that’ll help you cover even more ground with your fan casting. Remember, we are blessed to have this fishery…and if anglers don’t treat it respectfully by handling their fish with care and successfully releasing the majority of fish caught, this fishery will suffer significantly. While most fish you’ll catch are going to be less than 18″ and a couple pounds, there are some big ones available. The world record is 10 pounds 6 ounces and was caught in San Diego Bay on June 20th, 2008 by Carmen Rose. Shortfin corvina have sharp canine teeth, handle with care when releasing to ensure the survival of the fish and your fingers. CPR, Catch, Photo, Release, thank you. It’s good to see SDfish.com pushing for the CPR of the Corvina. Also, I must add a little bit of info. We not only have Shortfin Corvina,we also have Orangemouth in our waters. The bays are not the only places to catch the Corvina either. They are in the lagoons and surf as well as bays. However,much harder to target in the surf. Where is a good a place to fish these?